Our Spring start-up service consists of coming to your home to turn-on, review & program your home or commercial sprinkler system for the upcoming season. 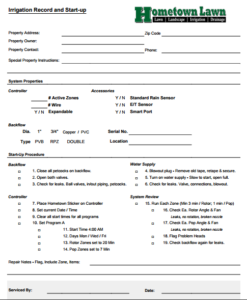 We perform our 19-point checklist to activate, review and start-up your sprinkler system. See the sheet here. We understand that most homeowners feel they are quite capable of turning on their systems in the Spring, which they are. However, if you know what to watch for, there is certainly more to it than opening a valve. Our goal when we come out is to pay for our visit. By that we try to save you the money you spent having us out by professionally reviewing and optimizing what we can to save that money over the upcoming season. Water waste is an unrealized expense. We are an up front realized expense. We do our best to save you our fees over time. Optional services include testing your backflow preventor in accordance with your municipal requirements. Either City of Olathe, WaterOne, Kansas City or other municipality. All services are available for residential and commercial clients.